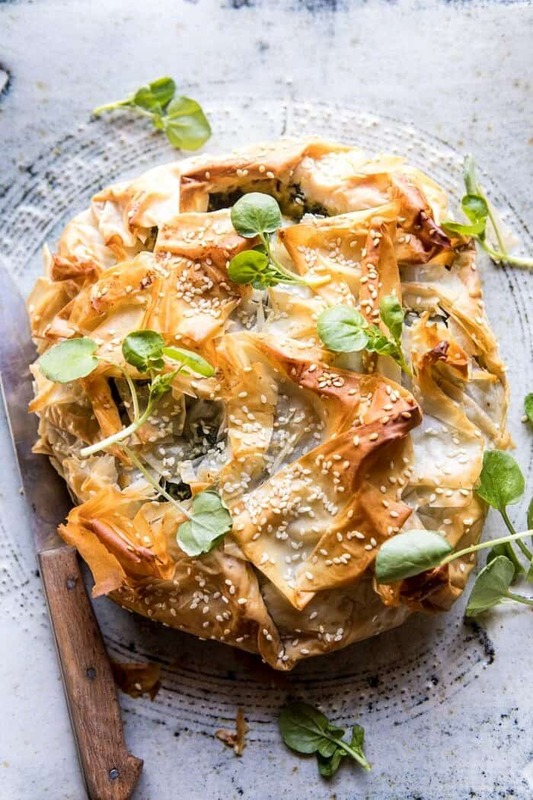 Sharing my favorite take on Greek Spinach and Feta Pie (Spanakopita). 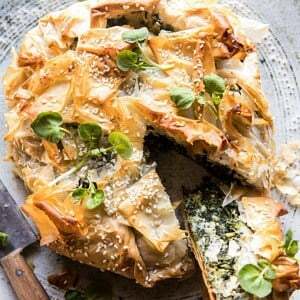 Also known as flakey, buttery, phyllo dough spinach pie with cheese. Also known as SO GOOD. SIDE NOTE: I semi hate the abbreviation AKA and one hundred percent prefer to write it out. Who is with me? 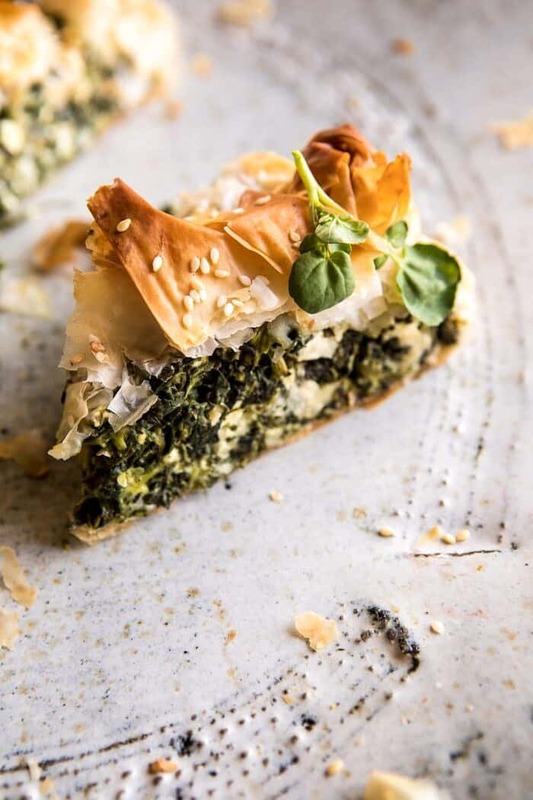 I’m not sure if this dish is well known or not, but if you don’t know about Greek spinach and feta pie, I am so excited to be the one to tell you all about it. 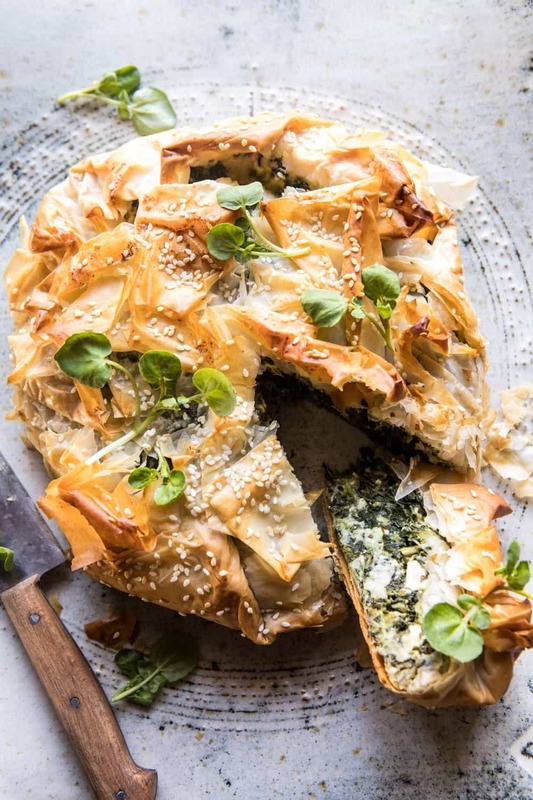 It’s actually a pretty simple thing, but the three main ingredients are what make it so good, phyllo dough, spinach, and feta cheese. It’s a combo that cannot be beat and it’s one that for some reason always reminds me of springtime. Here’s the deal, I totally made this recipe with one person in mind, my mom. The main reason I love to cook is because I love being able to see the happiness on family and friends faces when I cook for them. Providing them with so much happiness, simply by making food that comforts them, fills me with happiness. It’s a win, win situation for all. Anytime I make a recipe specifically for someone, I have to be there when they try it. Their facial expressions say it all, you know? Whenever I cook for my mom, I get the bonus of a nice little therapy session out of it as well. I swear, I don’t even know I’m stressed when I start talking, but every time we get together over food I’ll talk mom’s ear off for an hour. And then I feel one hundred times more relaxed. Mom’s just have that way with people don’t they? My mom has been working so hard lately on the Studio and I really just wanted to surprise her with a recipe that I knew she would love and enjoy. Some of mom’s favorite things are buttery pastries, and spinach is probably one of her most liked vegetables. So I knew she would love a pastry dish stuffed with spinach and feta cheese. And that’s where this Greek inspired spinach pie comes into play. It’s basically all of her favorites wrapped up in phyllo dough. 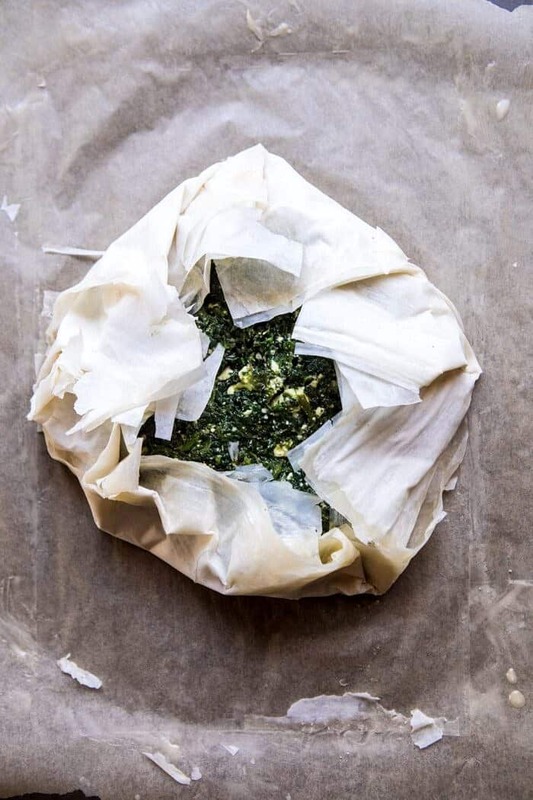 Traditionally, this dish is referred to as Spanakopita, but since I can’t even begin to pronounce that word (for real though…), I simplified things a bit and called the recipe exactly what it is, Greek spinach and feta pie. This savory pie is really very simple flavor wise, but trust me, it’s so delicious. Basically it’s just a mix of a lot of spinach with some eggs, herbs, and a generous amount of feta cheese. The filling is very similar to that of a frittata, but it’s the phyllo dough crust that takes this pie to another (better) level. 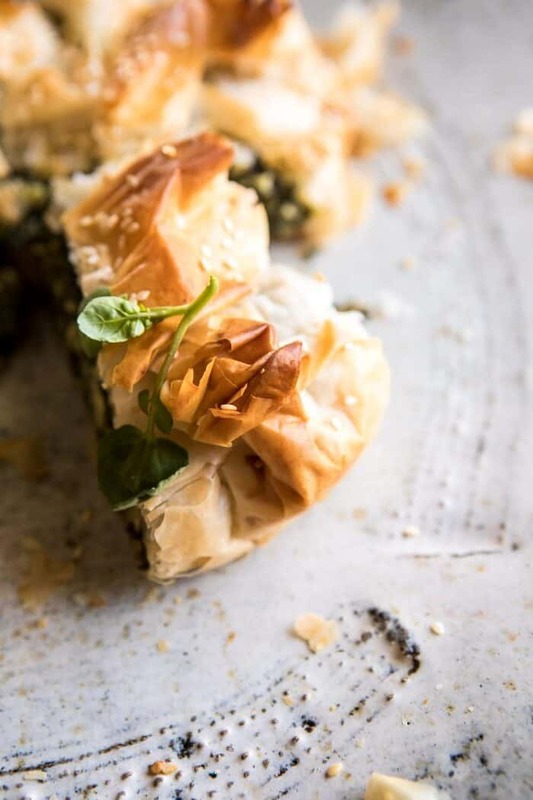 The spinach and feta filling get wrapped into phyllo dough and baked to a golden perfection. Now, I know phyllo dough gets a bad wrap of being hard to work with, but here’s the key to success when working with phyllo…butter. Brushing the dough with melted butter keeps the dough from drying out and tearing, not to mention adds yet another layer of delicious flavor. While I made this recipe with mom in mind, it’s also perfect for the spring days ahead. Plus, you can serve it up in so many ways…brunch, light lunch, dinner, a fancy side dish, or even an appetizer. I suppose this can even be eaten warm or cold, but you guys know me, I definitely prefer it warm. Actually, right out of the oven best. The cheese is soft, the spinach is hot, and the dough is buttery, flakey, and all kinds of amazing. When I finally got this recipe perfected (it took a few tries), I showed up at my parent’s house with a fresh out of the oven pie. Because like me, mom needs all her food to be steaming hot. The verdict? She loved it. Not surprised since I knew it had all the flavors she loves most! Traditionally, this dish is referred to as Spanakopita, but since I can't even begin to pronounce that word I will tell you that it's basically just a mix of a lot of spinach, some eggs, herbs, and a generous amount of feta cheese. Very similar to that of a frittata, but it's the phyllo dough crust that takes this pie to another (better) level. 2. In a medium bowl, combine the spinach, eggs, olive oil, feta, parmesan, basil, dill, oregano, lemon zest, garlic, crushed red pepper flakes, and a pinch each of salt and pepper. 3. Place 1 sheet of phyllo dough on the prepared baking sheet and brush the phyllo with melted butter. Repeat, layering 2 more times, placing the sheets of dough over top each other. Now brush another sheet of dough with butter and place perpendicular to the bottom layer, creating an X. Repeat this layer 2 more times. Brush another sheet of dough with butter and place slightly off center of the x. Repeat this layer 2 more times. Simplistically, you are using 9 sheets of phyllo dough, 3 layers, in 3 different directions, kind of like a star. 4. Take the spinach filling and spoon it onto the center of your phyllo dough star, leaving about 2 inches of edge space. Bring the edges of the dough up and over the spinach. 5. Brush the remaining 3 sheet of phyllo dough with butter and layer over top of the spinach, crinkling them slightly to fit. Sprinkle the sesame seeds over the dough. 6. Transfer to the oven and bake for 45-50 minutes, until phyllo is golden brown. Serve warm or at room temperature. For real though, that crust and that spinach feta filling? The BEST. Roasted Cauliflower Fried Halloumi Tacos with Spicy Avocado Basil Salsa. 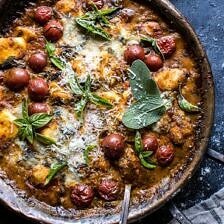 One-Pan Spinach and Cheese Gnocchi with Roasted Garlic Tomato Cream Sauce. My reward for checking email on a sleepless night! The recipe looks amazing, and I’m looking for inspiration but because of the eggs, cheese and butter, will have to wait until after Easter, which is coming right up. Spanakopita is pronounced just like it’s spelled. Thank you so much Nan! What size are your phyllo sheets? I so, so love this!! Thank you for your recipe. I would like to try it. One doubt. How many sheets of phyllo, 12 or 18? I understand they are 9 at the beginning and only 3 on the top. Right? Because reading the ingredients are 18….. Yesterday night I cooked one of your recipe: naan with ricotta. FANTASTIC!!!! This looks much more presentable than the one I make at home:-) now I’m going to be super annoying: since this has feta in it, it’s called spanakotiropita (tiro is for cheese). It does make it harder to say, but if you go to Greece and order a spanakopita, you risk getting a pie without cheese and your whole trip will be ruined! Such a great tip! Thank you! I love spanakopita. Thanks Tieghan. It’s interesting how you use basil and oregano in the recipe. I love your site. Though I follow several good bloggers, you are my favorite and I regularly try (and usually keep) your recipes! The spanakopita will be on the table for our vegetarian family members at Easter! Thanks. By the way, we live outside of Silverthorne part of the year. If you ever allow visitors to come to the studio barn, I would love to come. Let me know! Thank you so much Pam! I hope your vegetarian guests love this on Easter! I LOVE Spanikopita! 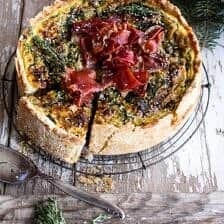 I will try your recipe for Easter appetizer along with Pizza Rustica. Do you know if you can make this the day before and bake it off right before serving? Thanks for another great recipe. This looks so delicious! I love the flavors together but it seems a lot easier to make one big pie instead of tiny little triangles. I’ll give this a shot sometime. Thank you Amber! I hope you love this! I SQUEALED when I saw this as your recipe for today. Last August, I spent 2 weeks in Greece and I can confidently say during those two weeks I saw the prettiest sites, ate the tastiest food, and I climbed the most stairs I have ever (not wanted to) climb in my entire life. Greece is paradise in it’s own unique way and I highly recommend anyone who has ever briefly thought about visiting to really try to make it happen – you won’t regret it. Since being back, I have slowly been attempting to recreate dishes I’ve eaten there (greek salad, baklava, chicken souvlaki, dolmades, moussaka, etc.) but I haven’t attempted to recreate spanakopita yet! Can’t wait to try this out soon!! I think it’ll pair nicely with the pan fried feta from your cookbook! That is amazing! I hope this turns out amazing for you and brings you right back to Greece haha! Thank you Cady! I’m with you…I love this warm, but don’t you think you could make early in the day and refrigerate it to bake just before serving? I always use rendered butter when I work with phyllo. Thanks for a great sounding version! What are nutrition amounts…..calories, etc? Hi Geri! I do not provide the nutritional information for my recipes, so sorry about this. I find that online calculators work best. Just be sure to divid by the number of servings! Let me know if you have any other questions! This dish is one of my ALL-TIME favorites. The combination of flavors and textures leave a lasting impression on your tastebuds! And I always love your photos. The creativity and beauty of the shots make the food so enticing. They inspire me as a food blogger. Thanks so much for all of the recipes you post. What a collection! Thank you so much Kristy! I am so glad you enjoy my recipes and photos! I’m confused about using the phyllo. The Ingredients call for 18 sheets but the instructions call for 12. Also, what are the sizes od the sheets? 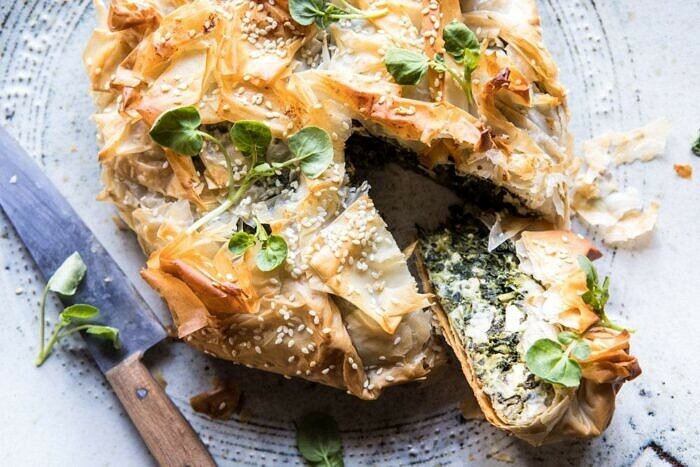 I looooove spanakopita – this looks great! Gonna have to give it a whirl. Thank you Mandy! I hope you love this! i bet your mom totally loved this Tieghan! Who wouldn’t? It looks awesome. This is SO gorgeous! It’s sure to be a crowd-pleaser for Easter! Thank you for responding to my email the other day. I’ve been loving your posts lately and am excited to hear more about the studio. That is so sweet of her! I hope you love this as well Kristin! Thanks! I’m that way with ASAP! Seems too demanding. AKA however always seems sort of cool and James Bond to me! Funny how responses vary! I guess it just reminds us to be careful what we write, because what we type may sound one way in our head, but come across totally different. I love your blog and your candor. I hope that comes across as a compliment, because that’s what I mean! Greek food rules as does this gorgeous recipe. 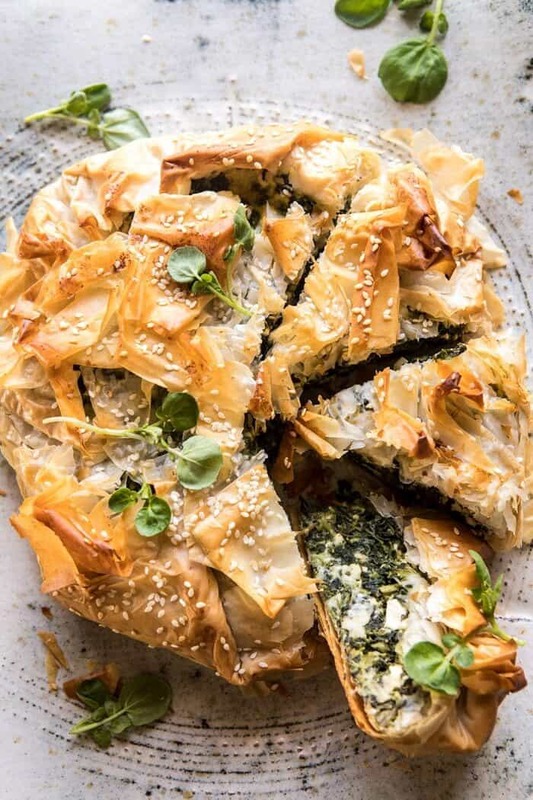 I love the flourish on top of your spanakopita pie. Got to travel to 3 Greek Islands back in the mid-90’s and it still remains close to my heart. Santorini was more old Greece and ate in the places the locals would go and got real home cooked fare. Some owners would ask what you wanted and they would round up the ingredients for you to come back next day that they made for you. Keep on exploring all these awesome World cuisines, they rock as do you! Wow that sounds so amazing! Thank you so much Tammy. I hope you love this recipe! WOW! This looks incredible! LOVE the crust!! That looks so perfectly crunchy and cheesy! It would make a great Easter appetizer. You had me at flakey and buttery. So comforting, love this! so beautiful! I love phyllo dough!! Your photos are beautiful! 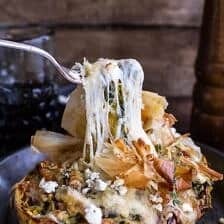 I love this dish and I’m inspired to make it ASAP! So excited to try this recipe out! Just wondering if the consistency would change if I used fresh Spinach instead? Oh yes… definitely familiar with this dish. Your version looks so delicious… and those flaky layers photographed beautifully! This looks incredible, love the flaky phyllo layers! This looks AH MAZE ING!! 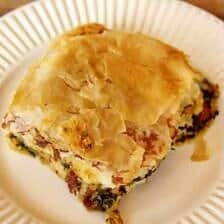 I LOVE spinach pie…I pretty much love anything with phyllo dough! I’m happy to have found you! Thank you Myriah! I am happy you found this recipe as well! I hope you love it! Another winner!! Made this today because I HAD to – LOL. I only had a large container of baby spinach from Costco, so my prep was a little longer and I was able to add some diced onions in the saute. But I did make a trip to the local Mediterranean market for fresh herbs – love fresh dill – and their feta; they also had pine nuts which I toasted and added to the top with the sesame seeds. Really liked the free-form shape and the ending look and presentation. IT WAS DELICIOUS – I don’t want to share. Took me back to my travels in Greece. Thank you for posting a recipe with so much flavor and eye appeal! That sounds so cool I will totally try to see it! Thank you Katie! My daughters favourite dish in our local Greek restaurant was Spanakopita, which came in three small triangular parcels, but unfortunately for her they took it off the menu and I’ve been on the lookout for a good recipe since. I did make some spinach bourekas before but using puff pastry not phyllo (or filo as it’s known here in Ireland) pastry. Anyway, I made this for dinner on Monday night and really enjoyed it. Might cut back just a touch on the lemon the next time for the kids but overall the filling was very tasty, I loved the mix of herbs, and the pastry was lovely and crisp and it looked so gorgeous with the sesame seeds on top. I’ve printed off the recipe and it’s now in my food file so I’ll definitely cook this again. Thanks for another great recipe Tieghan. That is so great! I am so glad you enjoyed this Linda! Thank you so much! I made this tonight and it was delicious! The trio of herbs, lemon, and red pepper flakes put a nice spin on the traditional recipe. This one’s a keeper! Made this for brunch and WOW what a bright and balanced dish. The fresh herbs and lemon worked beautifully together. I did not buy enough feta so I had to add a few ounces of shredded mozzarella. Loved this!!! Thank you!! I am so glad you loved this Lizabeth! Thank you so much! Thoughts on how well would this reheat? There are only two of us eating at my house, so it would need to survive a meal or two as leftovers. I’ve got all my fingers crossed, because I LOOOOOVE spanikopita. Thanks! The recipe looks damm tasty. will definitely try. The way you described each and everything with pictures is just awesome. Thanks for this recipe. Thank you so much Preeti! I’m 3/4 Greek, so I grew up on Greek food. I have to say that your take on this recipe I’m used to seeing it baked in a 13X9, but your method makes the presentation awesome! I love spanakopita! Made this paired with the recent NYT recipe for Greek baked shrimp. A restaurant-quality meal. Perfect addition to the Meatless Monday menu. Thank you so much Erin! I am so glad you loved this recipe! Im making this I hope in an hour or so for my moms birthday – can I do it it pie pans? Do you use a fan assisted oven or conventional? Hi Tania! I do not use a convection oven, just a regular one! That is so great! Thank you Tania! I’ve made this dish four times now and love it more and more with each bake. 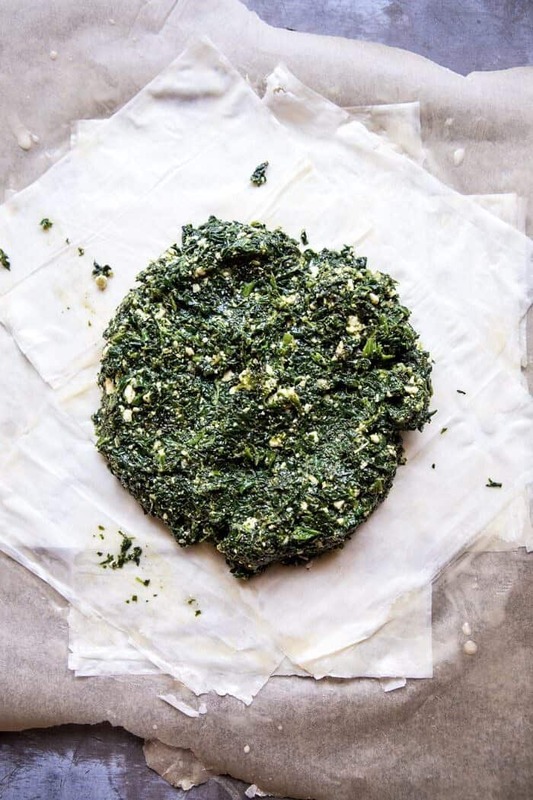 The parchment is still the toughest thing for me and I’m never sure how to wrap it around the “cake” of spinach but it still comes out tasting fantastic each and every time. I love how this recipe came out, and I’m making it this week coming up for my Greek mum. 😀 One tiny thing – maybe add sesame seeds to the ingredients list for people like me who use that with recipe and shopping apps? I’ve made this twice now and both times have forgotten to buy them, haha, so had to do without! Thanks for a terrific recipe! I am so sorry about that, Janey! But, I am really glad you liked this! Thank you! I made this right now anyway it looks absolutely beautiful! Tastes really authentic as well. I think it’s a little too lemony so I’ll cut back on the zest a little bit but it’s really tasty! Def putting this on rotation! I am so glad you loved this Jayna! Thank you so much! 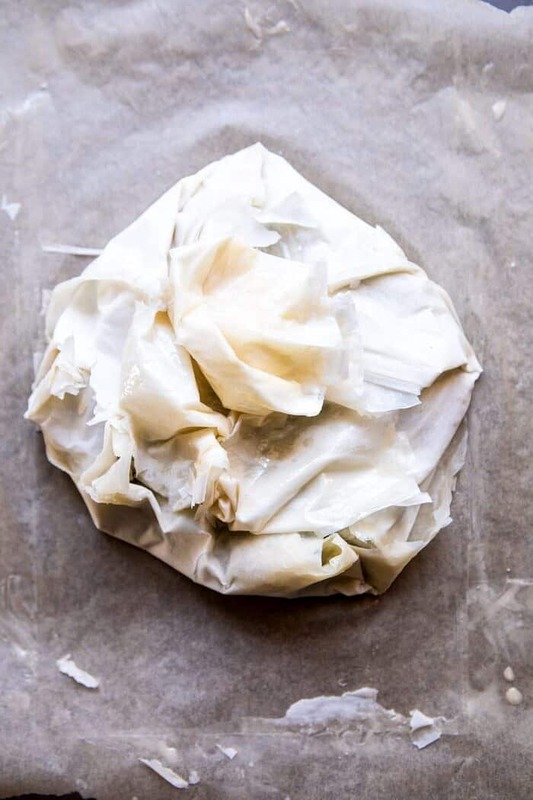 If anyone needs help wrapping the phyllo, there are step-by-step photos at Bon Appétit! Beautiful! My niece made this Christmas Eve as an appetizer. It was fantastic. I can not wait it my self it is do good! We all loved it. Even my husband who does not like cooked spinach. That is so amazing! Thank you Brenda! Can I substitute the eggs with a vegan substitute like flax or chia seed “eggs” at all, or do you think regular eggs would be the only thing that works for this recipe? Do you have any recommended reheating instructions? We have leftovers and want to see if it would still be good tomorrow if we reheat!